This article is about the plant. For the rabbit added by Pets of Skyrim, see Thistle (creature). 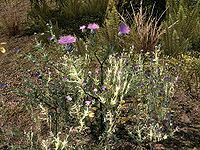 Thistle Branches are harvested from thistle plants, found at lower elevations, especially in the southern pine forests. The base magnitude of the Resist Poison effect for this ingredient is 3 instead of 4 and its duration is 0 instead of 60. This is only relevant if beehive husk and thistle branch are combined, in which case the resulting potion will have a 50% smaller magnitude than a typical custom Resist Poison potion—the magnitude is controlled by the properties of the beehive husk effect. This page was last modified on 9 September 2018, at 13:43.